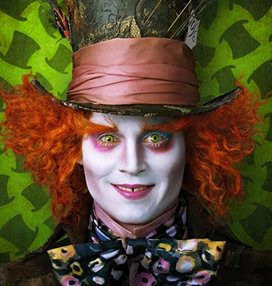 Alice In Wonderland Film Trailer Preview! Spotted! - White Rabbit T shirt! It's all getting a little bit too much! Having seen the official Movie Trailer for the much anticipated Alice In Wonderland Film next March I can hardly contain myself! Here's a link to the Trailer. Click Here. Looks like its going to be a good film when it's released. There's a lot of opportunity to make the film a bit mad and very visual as the story is a bit crazy anyway. Should be cool in 3d too! OMG, that looks amazing. Can't believe it is not our until next year!!! I know I really cannot wait. I think it's a bit cruel to let us see the trailer so soon!